We paddled down the Earn on a beautiful August day, with low water and a gentle west wind. 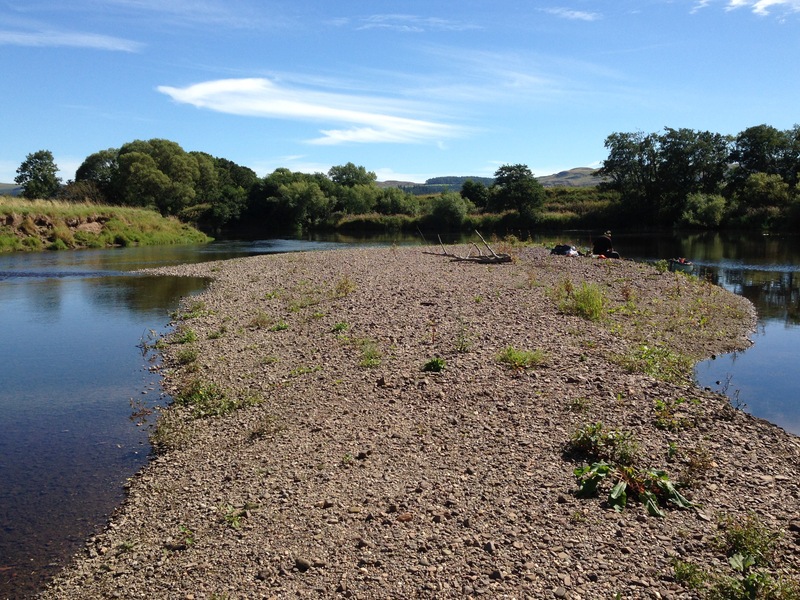 The canoe went into the river at Dalreoch Bridge and came out at Bridge of Earn. In between we had the company of kingfishers, swans, thousands of tiny fish, some larger ones, sand martins and sandpipers getting ready to fly south, noisy buzzards, an osprey, a peregrine falcon teaching its child to fly. 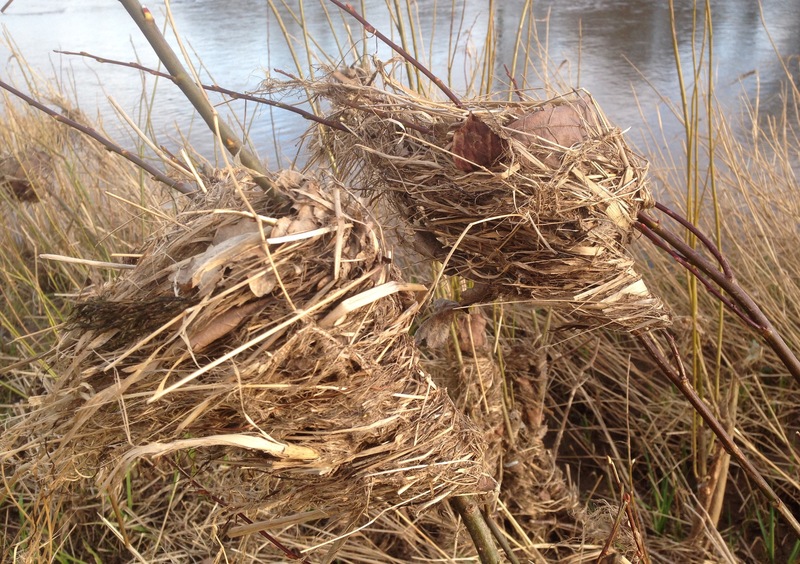 The evidence of last winter’s floods is still very clear. 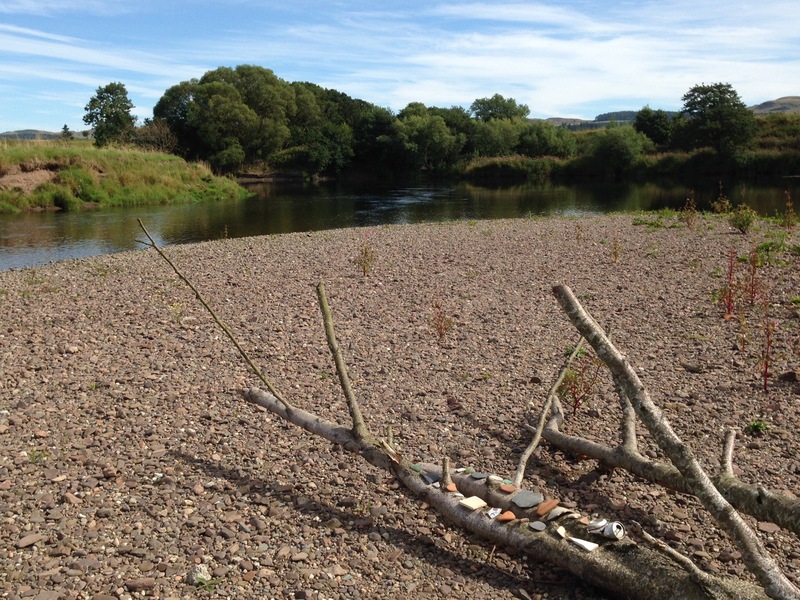 River debris is trapped high in the trees along the banks: clumps of dry vegetation, big branches, tree roots, even a wooden gate suspended at least ten feet above our heads. 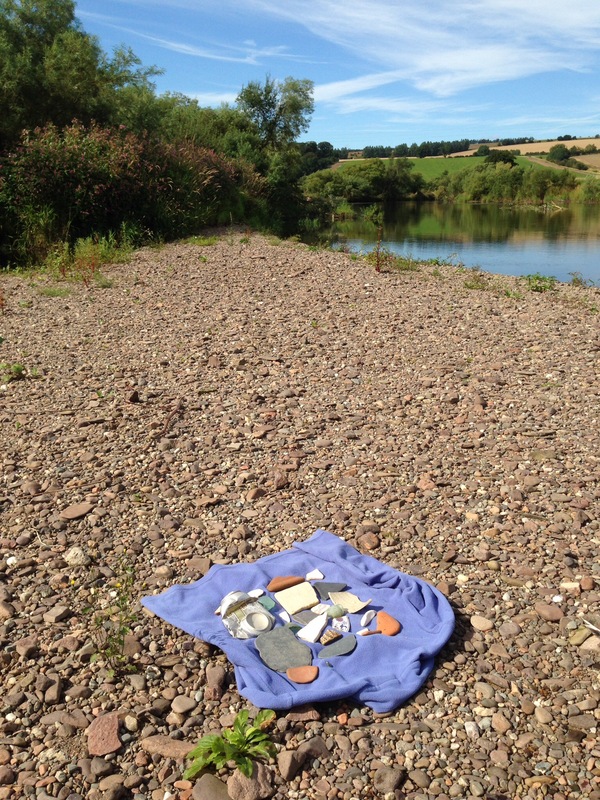 We stopped for lunch on a flood-carved gravel island, a nice open space free of the stinking Himalayan balsam that lines so much of the river bank. I like gravel islands. 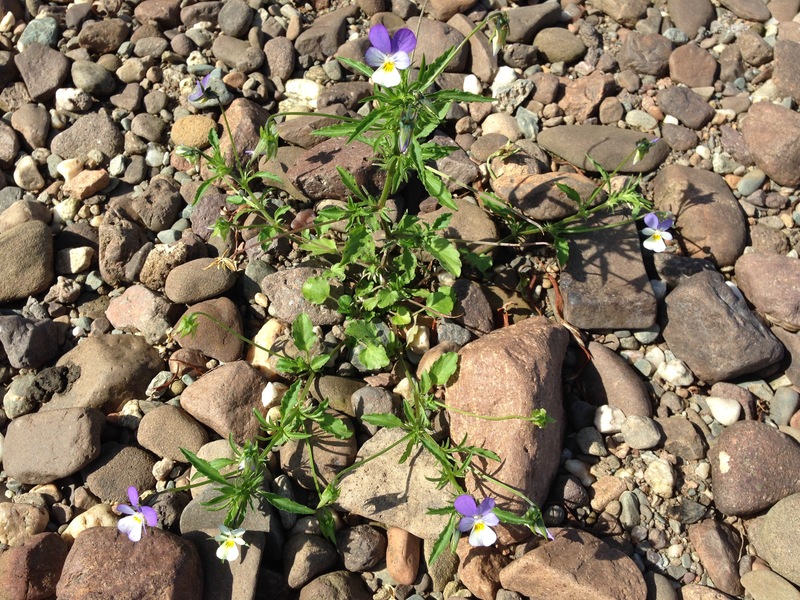 You can find interesting plants among the stones, like this wild pansy. The plants seem to enjoy the lack of competition on this year’s new land-surface and grow into lovely shapes. 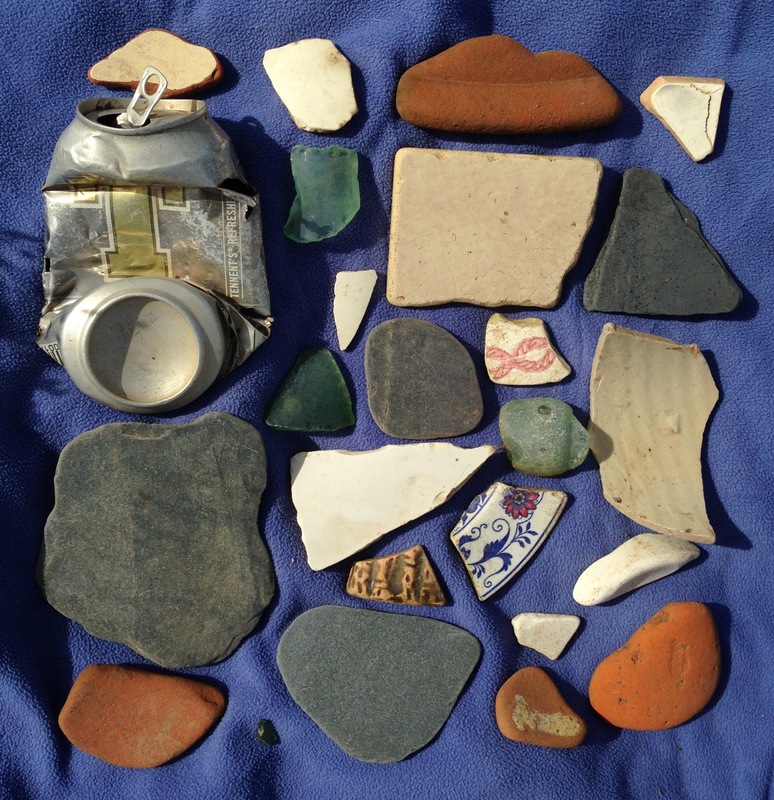 Bottle glass, crockery, bits of pan-tile and roofing slates, a lager can, ceramic tiles… I left it all for someone else to find – or for the next flood. 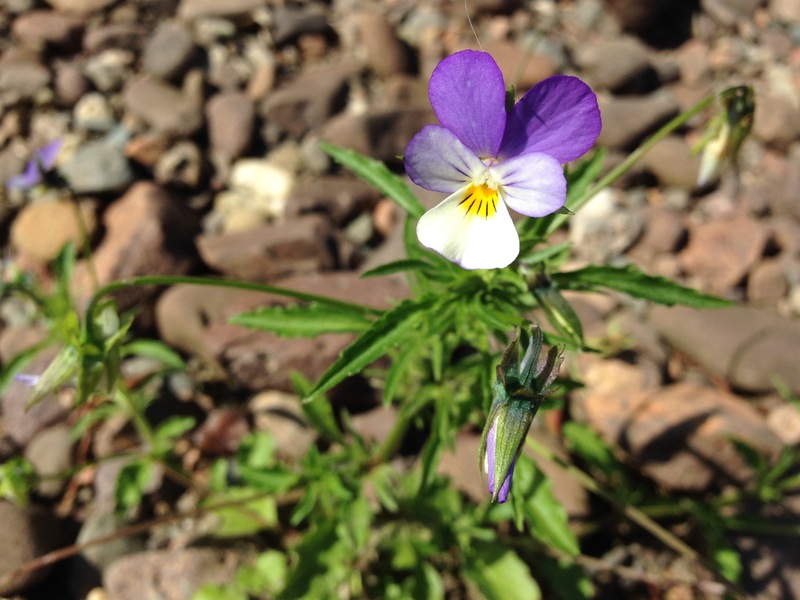 We walked along the north bank of the River Earn on Sunday, looking for wildlife and tracks and signs and enjoying the spring sun on our faces (next best thing to being ON the river, which we didn’t have time to do). There were noisy oystercatchers giving us away round every bend, we didn’t see any animals. We did find otter spraint (droppings) and beaver wood-chips, and some mud-slides that might be used by both species. That’s an entertaining thought. I wonder what otter and beaver make of each other? There’s a bit of spring growth along the river’s edge – some wild garlic leaves, aconites and celandines – but not enough to cover the evidence of this winter’s floods. In places the banks are a jumbled mass of uprooted trees, broken branches, plastic debris, dead vegetation, sand and gravel. It gave me a shiver to stand on the banks eight feet above the river and see flood debris hanging from branches above my head.